"Unfortunately" and "on condition that": with these two expressions Pope Francis explained what it is and how one really lives and to the end the forgiveness. In the Mass celebrated Tuesday morning, March 6th in Santa Marta, the Pope suggested that he was not ashamed to accuse himself of being "unfortunately" a sinner. And he reminded us that the Lord is always ready to forgive us "provided we" forgive others. "Also in this journey of conversion, which is Lent, today the Church makes us reflect on forgiveness," the Pope pointed out immediately, asking himself: "What is forgiveness? Where does forgiveness come from? " To answer these questions, Francis started from the "two readings of today" which, he said, "can be explained in two simple words: unfortunately and on condition that". These are precisely "the two words of today's message: unfortunately and on condition that". In the first reading, taken from the book of Daniel (3, 25.34-43) «Azaria, in the furnace of fire, prays to the Lord and asks:" Do not abandon us to the end, Lord, look at us "». Azaria "was in the furnace because he had not wanted to worship the idol: he only loved God". And in fact «he does not reproach God, he does not say:« But look, I have exposed myself for you, I have put the face for you and you so you pay me? »». Therefore Azaria "does not say this; goes to the root »and asks:« Why does this happen to me and our people? Because we have sinned. You are great Lord, you are great. You have always saved us, but unfortunately we have sinned. We wanted to serve you, but unfortunately we are sinners ". Precisely "at that moment - the Pope has relaunched - Azaria confesses his own sin: the sin of the people. He accuses himself ». And in fact "the accusation of ourselves is the first step towards forgiveness:" Lord, do not withdraw your mercy from us. We have become small, we have sins. We could be welcomed with a contrite heart, with a humbled spirit! "». Here is the accusation to themselves: "We have sinned, you are great, unfortunately I have sinned". "To accuse oneself is part of Christian wisdom," the Pope insisted. Certainly it is not Christian wisdom to "accuse others". We must instead accuse "oneself" and affirm: "I have sinned". And "when we approach the sacrament of penance," Francis suggested, we must "have this in mind: great God who has given us so many things and unfortunately I have sinned, I have offended the Lord and ask for salvation". 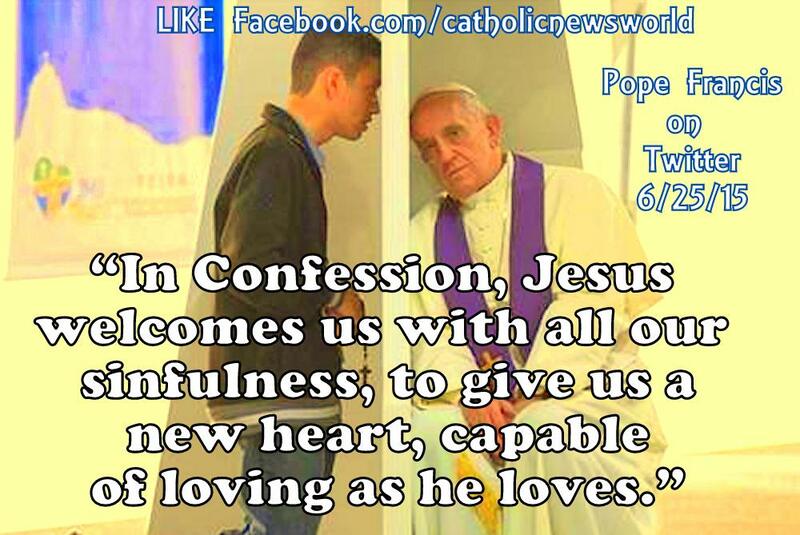 But "if I go to the sacrament of confession, of penance, and I begin to talk about the sins of others, I do not know what I am looking for" the Pope said: surely "I am not seeking forgiveness". Rather "I try to justify myself and no one can justify himself, only God justifies us". "I am reminded - Francis confided - that historical anecdote of a lady who approached the confessional and began to talk about her mother-in-law: what her mother-in-law did, how she made her suffer." And "after fifteen minutes the confessor told her:" Madam, she is well, you have confessed the sins of your mother-in-law, now confess your own "». "So many times we go to ask the Lord for forgiveness by justifying ourselves, seeing what the others have done badly," the Pope said. But the right attitude is to recognize that, "unfortunately, I have sinned". In short, "to accuse himself". And "this pleases the Lord, because the Lord receives the contrite heart". In this regard, the words of Azaria are clear: "There is no disappointment for those who trust in you". Because "the contrite heart tells the truth to the Lord:" I have done this, Lord, I have sinned against you "». But "the Lord stops his mouth, like his father to the prodigal son, does not let him speak: his love covers him, forgives everything". "To accuse ourselves", therefore. "When I go to confess, what do I do? Do you justify myself or accuse myself? "Is the question asked by Francesco. With the suggestion of "not being ashamed, he justifies us:" Lord, you are great, you have given me so many things, unfortunately, I have sinned "». «The Lord forgives us, always and not once» re-minds the Pontiff. «To us - he added - he says to forgive seventy times seven, always, because he always forgives:" I forgive you, but as long as you forgive others "». And referring to the Gospel passage of Matthew (18, 21-35), the Pope pointed out that "if you go to ask the Lord for forgiveness as this clerk, the Lord forgives him! But then if the clerk does not forgive his colleague ... ». And so, he added, "the forgiveness of God is strong in us, provided we forgive others". But, Francis warned, "this is not easy because the rancor puts the nest in our heart and there is always that bitterness".In fact "many times we bring with us the list of things that they have done to me: this has made me that, he has done that to me, he has done this to me". Without forgiving. "A confessor - the Pope continued, sharing another confidence - told me, once, that he found himself in trouble when he went to give the sacraments to an old woman who was about to die. The old woman of her sins was confessed well and also told family stories. And he said: "But madam, do you forgive these family members?" - "No, I do not forgive" ». The woman, the Pope said, was "attached to hatred, the devil had chained her to that hatred". And so "that old woman - old woman! - who was to die said: "I do not lose" ». The confessor, Francesco said, tried to talk to her about Jesus, which was good and she said yes, it was good and so she turned, she turned, she turned and said: "But do you think Jesus is good?" - "Yes, yes"". And the confessor "gave absolution, but hatred enslaved it". «I forgive you, as long as you forgive others: these are the two things that will help us to understand the path of forgiveness» concluded the Pontiff. And then we must "give glory to God:" You are great, Lord, you have done me so many good things, unfortunately I have sinned. Forgive me "-" Yes, I forgive you, seventy times seven, as long as you forgive others "». That "the Lord - he added - makes us understand these things".